Today’s guest(s): Dr. Mary Grassa O’Neill, archdiocesan secretary for education and superintendent of schools, and Dr. William McKersie, archdiocesan associate superintendent for academic excellence. 1st segment: Catholic schools are vital to the overall health of the Catholic church. They have experienced several challenges in recent years and so many have responded to this challenge and are working to rebuild Catholic schools that have strong Catholic identity, academic excellence and financial vitality. One of the challenges of Catholic schools now is the inability for many families to afford the tuition. A group of leaders in Boston is trying to do something about that, to eliminate anti-Catholic discriminatory statutes in the Massachusetts constitution and to lobby for educational tax credits that parents could apply to a Catholic School education. He also said, ““As long as we Catholics refuse to acknowledge that the overall health of the church in the United States is vitally linked not only to the survival but the revival of the Catholic school, we are likely to miss the enormous opportunity this present moment extends” to all of us as a Church. We look forward to discussing the state of Catholic Schools in the Archdiocese of Boston, the many initiatives underway to revitalize them, and this effort to repeal the Know Nothing amendments and enable educational tax credits during this entire hour on this special broadcast of The Good Catholic Life. 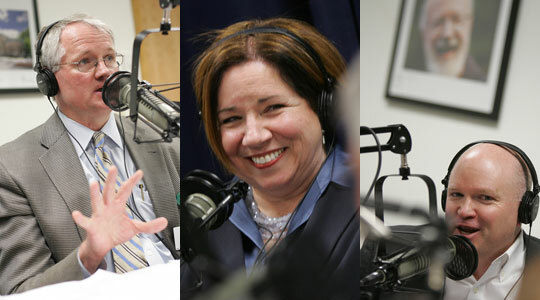 2nd segment: Scot welcomes Mary Grassa O’Neill, superintendent of Catholic schools in the archdiocese, and Bill McKersie, associate superintendent for academic excellence. Scot asked Mary what led her to come to the Archdiocese to take on the challenge to transform Catholic schools. The defining moment was when she was talking with Cardinal Sean about the benefits of her 12 years of Catholic education and he asked her if she didn’t want to see other children to receive the same opportunity. The big difference from her time as public school superintendent in Milton is that the Catholic schools are mission driven, to form the students as whole persons in character and integrity. Also, Catholic education is synonymous with excellence. So the area we struggle is financial viability. Bill also came from the Harvard Graduate School of Education and was asked by Mary to join her in helping to improve Catholic education. His whole career has had many opportunities to work with Catholic schools, especially in Chicago and Cleveland. He had a deep respect for the mission of Catholic schools, having seen what a difference high quality Catholic education makes in urban areas, like Chicago, Cleveland, and now Boston. Part of their drive has been to change the Archdiocese’s schools from a system of schools to a Catholic school system. Mary said we’re the second largest school district in Massachusetts, in number of students. It covers from Plymouth to New Hampshire. They work with very strong independent Catholic schools as well as parish schools and regional schools. There is a wide variety of charism, admission requirements, and more. One aspect of the mission is the make it affordable. Scot said staffing Catholics schools with faculty and staff is a national challenge. In 1960, religious made of 64% of faculty and staff, but now it’s just 4%, which presents a financial challenge because lay workers need higher pay and benefits. Bill said religious and clergy built what we have today, but what’s exciting now is that the laity is in the schools continuing what they have received. Our people are still taking a lower wage than they could get in public schools, but they are willing to take it for the sake of the schools. Hiring and pay decisions are made at the local level, but centrally they assist the schools where asked. Scot asked Mary how we’re forming the Catholic identity in schools. Mary said they’re building Catholic education for the future, for families, for localities, and for the nation. Catholic students are good citizens and members of society. Catholic schools are not merely for nostalgia. We are focusing professional development this year on spiritual leadership. They’ve done a lot of work with the Office for the New Evangelization of Youth and Young Adults. They’re doing a lot with technology and has received a matching grant from the Lynch Foundation to get SmartBoards into schools. They’re looking at curriculum, keeping up with the state and national standards, and they have a track record of exceeding what’s expected, especially in the urban schools. 3rd segment: Three principles: Catholic identity, academic excellence, and financial vitality in the schools. Scot said he was surprised at hearing the level of success in our Catholic schools. It’s been a well-kept secret. Bill said we’re in an era of data, numbers, statistics, but we go beyond basic assessment results. Massachusetts is top performing state in education and Catholic school exceed the public schools on all the assessment tests. What’s important to success is faculty committed to excellence. Clear strong leaders are focused on mission. To be a high quality school, you have to be excellent in morals, behavior, and academics. They push for results, but they also provide support. What’s key to Catholic education is both the standards and the push. The standards come from the faith and the push comes from the academics. A distinguishing characteristic of Catholic schools is formation of the whole student. Scot asked why that results in a better student and a better citizen. Bill gave an example of a school community where they helped the students deal with the death of a classmate, from a perspective rooted in the Catholic faith. Mary said they’re teaching youngsters how to be successful in life, and part of being successful in life is having a relationship with Jesus. It’s part of why the cardinal is so clear on his desire for the kids to be involved in the March for Life. While you will get the same science lessons as you will in public schools, in Catholic schools you will have an understanding of the moral and spiritual implications. Bill said that Catholic schools office is supportive of charter schools, but the cardinal has been clear that they are not Catholic. For Catholic charter schools, the Catholic element only takes place before and after school. It separates out Catholicism, but it’s not in the core of all classes and the environment. In Xaverian Brothers High School, for example, when you walk in the front door you see the chapel and then you see top-notch science labs. They go hand in hand. Mary said they have exceptionally high attendance rates (90% attendance); very high graduation rates, even in inner-city schools, well over 90% graduating within 4 years; and the vast majority go on to 4-year colleges. In nationally recognized assessment tests, our elementary school children regularly rate among the highest in the country. Catholic school students in Boston archdiocese have the best rate of attending college. Scot said Catholic schools benefit the common good of the state as well. Scot related a statistic that Catholic schools save the taxpayer $500 million per year in Massachusetts. Our school system is excellent and does it at half the cost of public schools. Average tuition is about $4,000 and the cost per pupil is about $6000. The average per pupil for public and charter schools is $12,000. Mary said nationally Catholic education saves the taxpayer about $20 billion with outstanding results in the students. Even atheists understand the benefit of Catholic education to our economy and to the well-being of the country and the future endeavors of the country. 4th segment: One of Mary’s initiatives has been the formation of Catholic academies versus parish schools. We have 5 Catholic academies. Mary said the academies were started by the Campaign for Catholic Schools, which thought merging small schools that were failing financially could help them survive. In Brockton, three schools merged on two campuses. In Dorchester, 7 schools have merged to 4 campuses with 1,300 students. After an academy forms, generally the total enrollment increases because greater resources and higher standards attract more students. They have established 12 standards of excellence for the academies. Students in South Boston are being accepted in exam schools at very high rates. Lawrence has seen Catholic school enrollment rise from 400 to 450 in just the first year. The Catholic School Foundation has given each of the new academies a gift of $150,000 to help the academies in their merger efforts. Mary said that while some people are sad to see their parish schools close, they often say how excited they are to see the opportunities that the new academies provide and the more assured futures they have. Bill noted that the Archdiocesan Catholic Schools office is a very lean administrative team compared to similar size school systems. He mentioned the area superintendents who provide leadership in the regions of the archdiocese. They are all lay individuals who care deeply about their faith and draw from across the Pastoral Center in various specialities, like real estate or legal. And in the boards of these schools, you also have expertise from laity in like manner, giving the religious who’ve run these schools for so long the expertise in areas they may not have had. The Cardinal commissioned a Catholic schools “x-ray” of all the elementary school finances. They came up with a tool that schools could use to monitor their own financial health and where they need to fix their own financial picture. They visited every school and produced a report that gives the Cardinal a clear idea of how the schools are doing, but also gave the schools’ leaders a business vocabulary and transformational information. Another initiative is to get the story of Catholic successes out to the wider world. Mary said when she first came, she told the Cardinal that there was an overabundance of humility that prevented us from talking about our successes. They just started a Facebook page and have just started into social networking on an organized level, especially in order to reach out to technologically savvy parents. Mary said they are working on technology advancement. Boston College is giving Catholic Schools the gift of a BC IT person to work with them part-time to help improve technology in schools. Other Catholic colleges are also working to help advance the mission of Catholic schools. 5th segment: Discussing a recent press conference and report given by the Pioneer Institute on a history of Catholic schooling in Massachusetts. It made two recommendations: that Mass. lawmakers should repeal the two Know Nothing or anti-aid amendments which are anti-Catholic and discriminatory and the second was that they should enact tax credit legislation to give parents great choice on where to send their children for school. Bill said Massachusetts is the only state with such strident anti-Catholic laws on the books. It goes back to the 1850s when the Know Nothing party, a nativist anti-immigrant group, put them on the books. Today, it affects anyone outside the public sector trying to have excellent schools, including Jewish schools and others. The Blaine amendments from the early 1900s make it very difficult to repeal the original Know Nothing amendments. The amendments prevent any public support for any non-public schools. Scot asked why legislators don’t want to touch this when it is so blatantly discriminatory. His sense is that there needs to be a groundswell of support from grassroots Catholics that say this should change because we would all suffer if Catholic schools can’t thrive. Bill said the way to deal with this effectively is as other states have done is to establish educational tax credits, to create a marketplace of schools that benefits all parents and students. Parents and Catholic schools are not asking for charity, but justice. It is a way of allowing Catholic schools to thrive without asking for public funding.